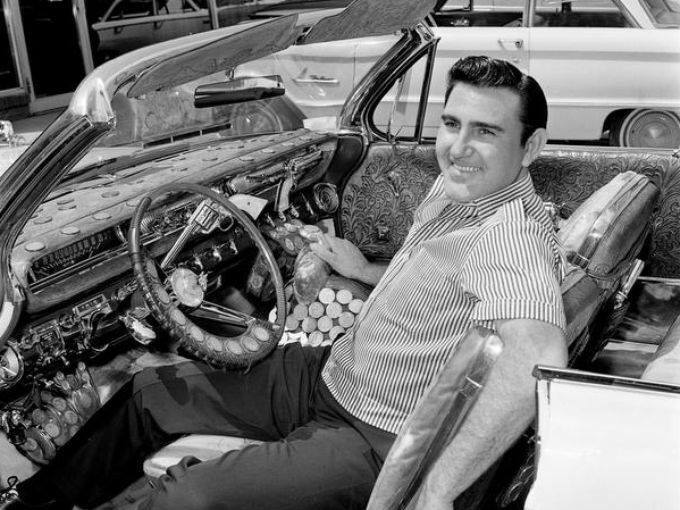 Often, when I am introducing one of the Webb Pierce songs I play, I talk about how comfortable he was in his fame and fortune in the 50s and early 60s. Among other things, he had a guitar shaped swimming pool at his home in Nashville, which was visited by paying tourists (up to 30,000 per year) until his neighbors shut that practice down. He also used to get specially tailored suites from Nudie Cohen. Nudie was one of several tailors who made those studded, embroidered and appliqued outfits that country stars like Porter Wagoner used to wear. Webb had a string of number one hits in the early 50s and figured he had it made. Then, along came Elvis Presley, who started appearing on package shows with the country stars of the time, forcing them to rise to the occasion and rock it up a little bit. The first baby boomers were reaching their teen years in the mid 50s, and for the first time in history, right many of them had spending money, and the kids wanted to dance. Here is one of the songs Webb wrote and began to perform at that time. The very edge of rockabilly and country. I Ain’t Never.